(Coneflowers) The first in the Broadway™ Series, Echinacea ‘Mama Mia’ PPAF is sure to be a hit! A designer color, large red-orange flowers change from red to orange to coral to pink. With an impressive habit and long bloom time ‘Mama Mia’ PPAF entertains from late spring-early summer thru late summer for your viewing enjoyment. (Treasure Flower) Big Kiss™ Yellow Flame Gazinia has exciting color patterns that will create a hot spot in your gardens. 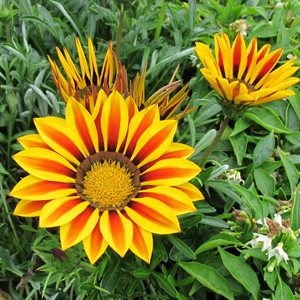 The striped extra large, highly contrasted orange and yellow petals of Big Kiss™ Yellow Flame fan around the golden eye of the daisy-looking beauty. The blooms close at night and on days that are cloudy. Gazinias can be used in planters or plant them in mass in your annual gardens. Bring the beautiful colors of Sunrise into your garden for an all day show with Bandana® Cherry Sunrise Lantana. The range of eye popping color is so amazing your friends will want to know what it is. The sweet scent of Bandana® Cherry Sunrise Lantana is sure to bring hummingbirds to your garden for a sweet treat. Bandana® Cherry Sunrise offers larger flowers, a nice trailing habit for containers, and can be used in the landscape as a sprawling ground cover! 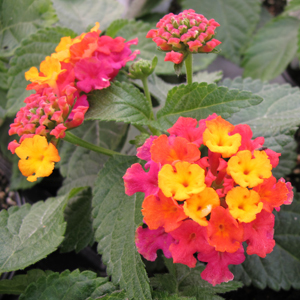 Be sure to check out all of the great Lantana that we offer! It’s no joke, Hemerocallis ‘Fooled Me’ is a wonderful Designer Daylily! Hemerocallis ‘Fooled Me’ is a 5 ½ inch golden yellow flower that creates visual interest with an attractive deep red eye and matching picotee edge. The award winning blooms also boast “pie crust” crimped edges on the rounded petals. ‘Fooled Me’ blooms midsummer with extended bloom flowers that last at least 16 hours each. I just love the looks of this new Tuberous Begonia that we are carrying this year. The intense orange color really sets this Begonia ablaze. The large flower size will really draw attention to your baskets or planters. 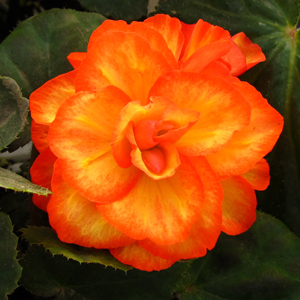 Nonstop® Fire Begonia sports fully double fire orange flowers on dark green foliage. Begonias add a splash of color to your shade/part shade locations. And as an added bonus Nonstop® Fire Begonia is pet friendly.